Making French Toast on a lazy Saturday morning is a great way to start the weekend. Get our stuffed French Toast recipe down below, along with a Strawberry Champagne Cream Cheese Jam. This breakfast recipe would be great to make as a Christmas morning breakfast. Who doesn’t love French Toast? I mean really, you’d have to be insane to deny yourself such a delightful treat. I get it though, or maybe you’re lactose intolerant, and if that’s the case you’re completely off the hook. Anyway, faux insults aside this is a totally decadent recipe that will make you wanna smack somebody because it’s SO GOOD! There’s a story behind our discovery of the Stonewall Kitchen Strawberry Champagne Jam, serendipity anyone? Basically, I had a popular Michigan-made brand in mind for this recipe, but when I went looking for it at the only local store I knew that carried it, lo and behold the brand that cannot be named wasn’t there. GASP! Now, at first blush this may seem Westside Story tragic (or Wuthering Heights tragic, I can’t decide) but alas all is not lost. I quickly got a grip on my disappointment and got myself together. Anyway, while we were there the super helpful store clerk suggested we try the Strawberry Champagne Jam, and boy was she right? And just as she enthused, you can really taste the champagne. S0, we totally won big today. Maybe not lottery big but in terms of deliciousness we scored a jackpot. We also topped our lovely stuffed French toast with a farm fresh duck egg from our wonderful neighbors Susan and Joann Dowker who run Dowker Farms. These ladies are always so nice and welcoming and their eggs are always delicious and at times double-yoked! They also raise Boer, Nubian and Nupine goats, chickens, ducks, and rabbits. If you’re local and you want fresh eggs, give them a call to check for availability. But the wonderful staff at October Moon Art Gallery & Gift Boutique suggested an alternative. Well, what is this wonderful stand-in for what I was looking for? She, Dawn, suggested one of her favorites, the Stonewall Kitchen Strawberry Champagne Jam. I was a bit dubious at first, mostly because you know how it is when you have your mind set on something quite specific and then you have to settle for something else it just doesn’t sit right. But boy was she right! And like she mentioned, “You can actually taste the champagne…” Well, thank you and we’ll be returning for more goodies. Alright, enough talk, let’s get down to brass tacks and make something good! 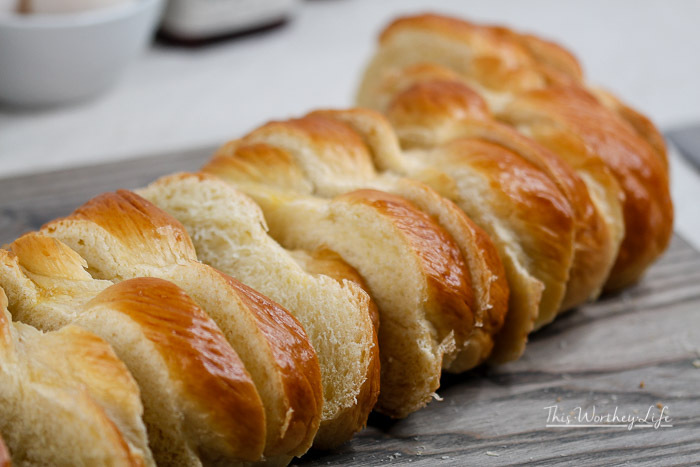 Say it with me, “Challah” bread! I am not sure if there is a better bread more suitable for making French toast. I really don’t. If you know of one please let a brotha’ know. The Challah bread is what makes this Stuffed French Toast so delicious. Challah is an open-crumb egg bread and it is perfect for any French toast recipe. “It’s so fluffy I could die!” Guess what children’s movie the quote is from and I’ll be impressed. I cut the Challah (pronounced without the C) into 1/2 inch slices with my Chicago Cutlery Serrated Bread Knife, but if you desire thicker slices then, by all means, go big or go home! Wait, you’re already home aren’t ya?! When making the French toast batter I like using local farm fresh eggs. It’s nice to support your local farms, they’ll appreciate it kindly. We sweetened our French toast batter with locally sourced honey and a little bit of organic light brown sugar. Sweet tooth approved! YUM! And can you really have delicious tasting French toast without a dash or two of ground cinnamon? That’s what we thought too. So glad we’re on the same page on this one. Allow the bread to soak up all of the French toast batter goodness for four minutes per side, you won’t regret it not one little bit! Can you say, “Golden Brown? !” We pan-cooked our luscious French toast with 100% unsalted sweet cream butter, all I am going to say is Amish butter is the real deal. So freakin’ good! Are we making you hungry? See, this is a classic “sorry, not sorry” kinda thing. And that’s why we’re sharing the recipe. If we didn’t I am sure there would be a problem. Brunch is served. If you are all about giving the folks in your life good things to eat, and making your kitchen game indispensable in the process, this is the recipe that will make them adore you even more! In a food processor add 4 ounces of room temperature cream cheese and 4 tablespoons of Stonewall Kitchen Strawberry Champagne Jam then pulse until smooth. Set aside. Cut bread into half-inch to one-inch slices and set aside. In a large bowl add fresh eggs, half and half, light brown sugar, pure vanilla extract, ground cinnamon, and a pinch of sea salt. Using a whisk combine all of the ingredients until the egg yolks dispersed with no clumps. Pour the French toast batter into a large high-walled dish, place the cut bread slices into the batter and let them soak for about four minutes. After four minutes flip them and soak for another four minutes. Next, preheat a non-stick skillet over med-high heat and melt two pats of butter. When the butter has melted, place two slices of battered bread into the hot skillet. Cook each side until golden brown, should take about 4-5 minutes per side. Also, add two more pats of butter when you flip the French toast over. Repeat process until all of the French toast is made. Place finished French toast into an oven set on the “keep warm” setting. Wipe the skillet clean and add a pat of butter or a little extra virgin olive oil over med-high heat. When the skillet is hot crack the duck egg into the center of the skillet, cook the egg sunnyside up and add a sprinkle of sea salt and freshly cracked black peppercorns. When the egg is cooked to your liking remove it and place it on a small plate. Pour about 2 ounces of Stonewall Maine Maple Syrup into the center of a warmed plate. Place a slice of French toast on a plate and add the Strawberry Champagne Jam Cream Cheese, then add another slice of French toast and repeat the process. Add the fried sunnyside up duck egg on top and add shavings of Gruyère cheese. Serve. Place finished French toast into an oven set on the "keep warm" setting. My husband would LOVE This!! He’s a stuffed french toast kinda guy and if it’s on the menu whenever we go to any breakfast place, its what we order, but it’s best to make your own! Thank you Annmarie John! And yes, good Stuffed French Toast is my jam! And agreed, homemade French toast is so easy and so good!